The 2017 edition of NFPA 70®, National Electrical Code® (NEC) presents the latest comprehensive regulations for electrical wiring, overcurrent protection, grounding, and installation of equipment. Featuring a durable, five-ring binder, this performance-boosting NEC Looseleaf format lets you insert all the extra technical information and other data you need on an electrical project within relevant sections of the Code. 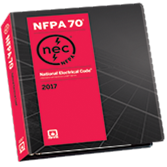 Stay up-to-code and organized with the 2014 NFPA 70®: National Electrical Code® Looseleaf from NFPA®. Choose the 2014 NEC Looseleaf, with a durable 5-ring binder that makes it easy to add job-specific materials or remove or reorganize information. Order your 2014 NEC Looseleaf today and customize your Code for every electrical project. Interested in other editions of the NEC Looseleaf? Use the drop down menu above to select the edition year you need.